I like Dungeons & Dragons. I like Jones Soda. Naturally, I should like Jones' Dungeons & Dragons Limited Edition Spellcasting Soda. One look at the labels, and I knew I had to buy a case. Potion of Healing. Dwarven Draught. Eldritch Blast. Sneak Attack. Bigby's Crushing Thirst Quencher. Illithid Brain Juice. It was a beautiful sight to beholder. I had seen and heard tell of exotic soda flavors from Jones in the past--flavors such as Candy Corn for Halloween and Turkey & Gravy for Thanksgiving. I could only begin to imagine what Illithid Brain Juice would taste like. I placed my order online (as I tend to keep out of direct sunlight and therefore wouldn't have seen the product in stores), and I cringed because the shipping cost almost doubled the price, and I waited. "Please note that due to high demand for these limited edition hand-made bottles orders are taking up to 2 weeks to process and ship. Thanks for your patience!" So I waited a little longer than usual. Then I got an e-mail from the Jones people saying there was a high demand for these limited edition sodas, and because each soda is lovingly handcrafted, it would be just a little longer before my batch was ready. Thank me for my patience. Almost a month after placing my order, a package finally arrived. It was a large book that fooled me into thinking it was a 6-pack of glass soda bottles. I continued to wait. At last, a month after placing my order, a package finally arrived. This time, there were sodas inside. I immediately opened the Potion of Healing. 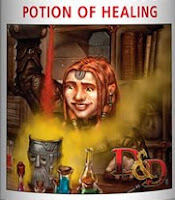 Page 229 of the Dungeon Master's Guide v.3.5 suggests that a potion of healing might taste something like almonds, so I bristled with anticipation as I drew the bottle toward my nose. For smelling it, that is; I drink out of my mouth. Hm. A vaguely fruity smell with a hint of nuttiness. Intriguing. I tasted it. Still vaguely nutty (which was probably just my eager imagination) and fruity (some sort of dark berry, perhaps? ), quite fizzy, and with a mildly creamy aftertaste. Decent, but I needed something like water to wash it down with. Curious. An odd soda, to be sure, but creative enough to make me happy. Besides, I was more interested in the other crazy flavors the fine folks at Jones came up with. I wanted to know what a Sneak Attack to the face tasted like. Apparently, it tastes like cream soda. I would have caught on soon enough, but it was pointed out to me that these were not, in fact, lovingly handcrafted sodas. They were lovingly handcrafted bottles containing regular (but still delicious) Jones soda. Dwarven Draught? Root beer. Eldritch Blast? Green apple. Bigby's Crushing Thirst Quencher? Cola. 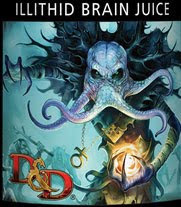 Illithid Brain Juice? Grape soda. And that strange Potion of Healing? Sugar-free black cherry soda. I was disappointed, to tell you the truth. Soda bottles with D&D-themed labels are great fun and all, but I'm not much of a collector of knickknacks and bric-a-brac; the D&D affiliation caught my interest, but the potentially weird flavors are what moved me to order a case. "Four out of five adventurers agree: A Potion of Healing is the perfect pick-me-up after going a few rounds with an ancient red dragon. (The fifth adventurer was eaten.) Effect: You can spend a healing surge and end all thirst-related effects you suffer." Cute, right? I'm not sure if it was quite worth all the waiting and the money I spent, but I can at least claim I'm a big enough D&D dork to have ordered the sodas in the first place. Plus, let's face it: Brain juice probably tastes like grape soda anyways. On the other hand, there's always the Potion here in Japan. It tastes terrible, which means it must really be medicine!